ENERCAP has been invited to participate to the international forum on « Renewable Energy » in N’Djamena, Chad. During the forum, ENERCAP has shared its deep understanding and experience of the energetic context in Africa along with leading African and European actors in the field of energy and carbon. The forum was also the opportunity for ENERCAP to present its two large scale energy program in Africa : EcoProfitable Lighting™ Africa & SunLighting™ Africa. 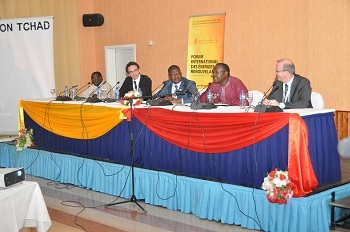 The forum was held in N’Djamena, Chad from January 31st to February 5th 2012. Idriss Deby Itno, President of the Republic, and the SEM have participated to this forum, which will remain as the starting point for the development of renewable energy in the country. Following this success, ENERCAP has been approached to assist other African governments in the implementation of programs and ambitious initiatives in the field of clean energy.